You trying hard to have bro Keith contact Gentle Jesus and have him cast a spell on you nuh? Is that from a book, Anta? You mean Jesus is a witch? It's not from a book, just a graphic. Religion may just be the biggest scam ever perpetrated on people. Animals don't know or seem to have any need for religion. Maybe it is a scam on people because people can write a check while animals can't. Christians write cheques to keep the Word alive and provide humanitarian assistance. I guees fools can never be wise on account of the ignorance on why christians give tithes, offerings and love gifts. Aeithists always miss dah bus. Christians give their love gifts to the preachers and the preachers turn around and give those love gifts to their lovers. The key is to keep terrifyingly people about sins and you keep them bounded without any ropes. Another victim of the sin scam? Religion and politics are two areas where people are scammed out of their money. The politicians will say, "see what that person did? DONATE." Same with the preacher. They will say, God loves you, DONATE." And when everything else fails, they use the sin scam to achieve their goals. My brother in law is very comfortable off and would have never guessed that he had issues until he asked a pandit to do a pooja for his birthday. The pandit was not satisfied with just doing that one pooja but started telling my brother in law that there are so many hidden problems that he doesn't know about and that he needs to do these other poojas. My brother in law just listened and decided that he is fine with his life. The scammers are aplenty. BEWARE!!! These crooks prey on the gullible,people who have faith in their religion need to read their religious books,seek guidance from others when there are doubts what is written.We live in a modern world. The question I always ask is how can Person A be so easily convinced by Person B that he/she needs an intermediary with God, and that that intermediary is conveniently person B, and, of course, there's a fee involved. I'm not religious but I believe a relationship with God, if there is a God, has to personal. Yet these bloodsuckers are becoming millionaires scamming the poor. 'God' if i want to seek and have a relationship,thankfully i can read,as such i will find him through the holy books.For now i have my reservations.For those who believe it's your choice and i do respect. Whatever the bloodsuckers can use to make money off of. All the holy books are biased and contain stories relative to a specific geographic area. For me, that discredits their holiness and defines them as exaggerated historical accounts. If you believe in creation and a supreme being, all you need do is open your mind to the idea and you're in touch with God. Sin is described as transgression of the law of God and rebellion against God. In the book of Genesis describes Adam and Eve's rebellion against God and against His command. Since that time, sin has been passed down through all the generations of mankind and we, Adam's descendants, have inherited sin from him. Romans 5:12 tells us that through Adam sin entered the world, and so death was passed on to all men because "the wages of sin is death" see Romans 6:23 for reference. We are sinners not because we sin; rather, we sin because we are sinners. This passed on depravity is known as inherited sin. Just as we inherit physical characteristics from our parents, we inherit our sinful natures from Adam. Psalm 51:5 states, "Surely I was sinful at birth, sinful from the time my mother conceived me." There are tree types of sin which I will mention later.....I am heading to a meeting. Oh gee... now that you've taken the time to post quotes that are readily available for all to read, I'm really convinced. As I mention earlier there are three types of sin the first was inherited sin then we have imputed sin. Used in both financial and legal settings, the Greek word translated "imputed" means "to take something that belongs to someone and credit it to another's account." Before the Law of Moses was given, sin was not imputed to man, although men were still sinners because of inherited sin. After the Law was given, sins committed in violation of the Law were imputed. Even before transgressions of the law were imputed to men, the ultimate penalty for sin (death) continued to reign. All humans, from Adam to Moses, were subject to death, not because of their sinful acts against the Mosaic Law (which they did not have), but because of their own inherited sinful nature. Another type of sin is personal sin, that which is committed every day by every human being. Because we have inherited a sin nature from Adam, we commit individual, personal sins, everything from seemingly innocent untruths to murder. Those who have not placed their faith in Jesus Christ must pay the penalty for these personal sins, as well as inherited and imputed sin. As believers we can choose whether or not to commit personal sins because we have the power to resist sin through the Holy Spirit who dwells within us, sanctifying and convicting us of our sins when we do commit them. Once we confess our personal sins to God and ask forgiveness for them, we are restored to perfect fellowship and communion with Him. "If we confess our sins, He is faithful and just to forgive us our sins and cleanse us from all unrighteousness", 1 John 1:9. We are condemned due to inherited sin, imputed sin, and personal sin. The only just penalty for this sin is death according to Romans 6:23, not just physical death but eternal death, Revelation 20:11-15. Thankfully, inherited sin, imputed sin, and personal sin have all been crucified on the cross of Jesus. If sin is automatic at birth, how can one person who has just as much sin provide absolution for another? One can only provide absolution for another only if he/she themselves received absolution. In other words I cannot pray asking God to forgive you of your sin if I never confess and ask God to forgive me for my sins. The Bible in James 5:16 says, "Confess your faults one to another, and pray one for another, that ye may be healed. The effectual fervent prayer of a righteous man availeth much." 1 John 1:9 also states, "If we confess our sins, he is faithful and just to forgive us our sins, and to cleanse us from all unrighteousness." We our self can pray and ask for forgiveness for the sins we have committed and be free from that guilt. We ask others to pray for us so we can received absolution but we have to be careful when they themselves might need prayer for sinful things they have done if they have not repented of their sins. Find a closet, humble yourself on your knees and make your confession before God. He will free you from your guilt. I didn't say find a priest ;) ....I am joking. So the sin scam is real? I don't understand your question. What way would sin be a scam? You didn't read the first post in this thread? I read the first post? Where did Mr. Scherlock got his information from? What about you, do you think it's a scam? 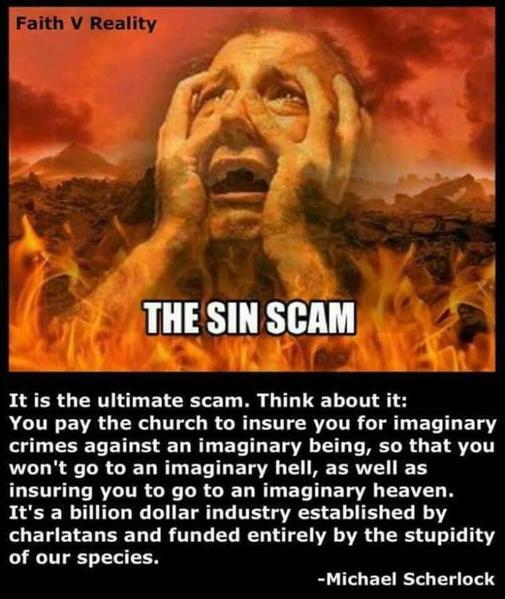 Have you witness people paying churches to stay out, "imaginary hell" as the post stated. Have you witness people paying churches to stay out, "imaginary hell" as the post stated. Haven't you? Remember the ninth commandment. I've not witness nor do I know of any cases where people are paying churches to stay out of hell or to get into heaven. So you are helping Mr. Scherlock spread false information, "fake news"
Look, the bottom line, there are wicked folks out there who would do anything to get rich even to pretend to be pastor, imam or a pandit etc. When they are exposed it shines a bad light on religion but most of all it destroy people lives and believes. We all have to answer for the consequences of our actions. We can be forgiven for the action but the consequence is there. "You shall not give false testimony against your neighbor." This is a command prohibiting testifying against another person falsely. It is essentially a command against lying. Why do people send their hard-earned money to bloodsucking priests? Joel Osteen does not have any sellable skills. Yet he is worth millions. How much personal wealth does Osteen as well as other preachers need. Not that Muslims practice this but the Qur'anic passage stated: "They asked you how much (of their money) they should give away in charity. Tell them all that they don't NEED". I am not making a case for the Qur'an or Muslims because there are matters there too that can be objectionable. Personally, I think that the preachers of all religions are a bunch of crooks who instill the fear of sin and hell in peoples' minds so they can bleed them. Politicians do the same. The setting up of churches is BIG business, firstly the money is tax free, no property taxes. The priests have to earn a living, they are given hand books as to how to raise money , all in the name of God. To be a successful preacher, you have to know how to manipulate the congregation , it's no different than a car salesman. Enoch wrote about ppl like u.
Yuh head muss be really hard. I telling yuh why christians give their money. Yuh really want us CHRISTIANS to believe in you and wah yuh believe? What is the name of your CULT? Yuh trying to solicit funds? Except that you will actually get a car from a car salesman. Preachers con you into selling you something you have to die first to receive. And if after you die and don't get that promise, it will be too late to utilize the lemon law. I'm flattered but I doubt it. Yeah.... my head hard because I'm NOT a victim of the sin scam. Yeah.. I want you to believe in what I believe, that's why I DON'T ram my beliefs down your throat every day. Yeah... I'm trying to solicit funds that's why I'm CRITICIZING the practice of soliciting funds in the name of religion to fund massive mansions. And who head really hard again? I agree there are "bloodsucking" preachers. People now don't want a preacher who would preach about hell, right and wrong, they want a preacher who would preach prosperity which insight people to give. Now this is just my take, I could be wrong. Tithes/offering given to the church should be used solely to pay utilities, musicians and yes even the preacher, a cap annual salary regardless of size of the church. If I had to put a annual salary for a preacher I would set it at $35K tax free . The rest of the money should be used to build up the community around the church and beyond. Why should tithes be given to the church?